Lee and I went to a Christmas party put on by my employer, at a classyhotel in Atlanta. After the fun began, we remembered the camera wasstill up in our room, so I volunteered to retrieve it. 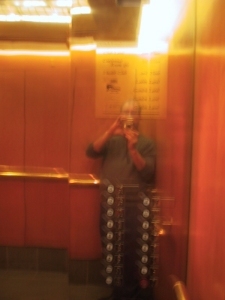 Alone in theelevator, seeing the shiny metalic walls, I thought of Jezebel's mirrorand snapped a picture. I really liked the way it turned out, but the oneon the way up, with an elevator full of partiers, didn't do so well. Thephotographer on the second picture had his fill of cheer, and forgot toturn off the flash, frame it, and needed a bit of help standing err....steadying the camera.